LOS ANGELES, February 2, 2017 /3BL Media/ - On Thursday, Feb. 9, 2017, Whole Planet Foundation, Clamorhouse and other valued partners will honor Olowo-n’djo Tchala and Prairie Rose Hyde, co-founders of Alaffia, for alleviating poverty in Togo and around the globe. 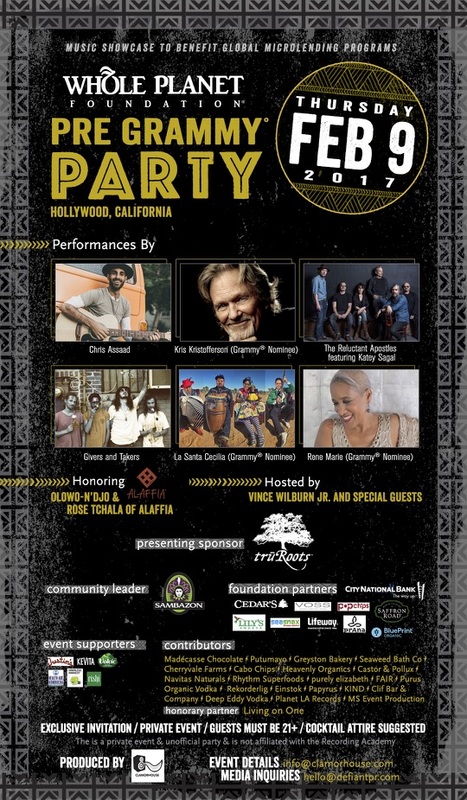 The celebration will take place at Whole Planet Foundation’s biennial pre-GRAMMY benefit, which will be held at OHM Nightclub in Los Angeles. Note: This event is not affiliated with, endorsed by, or licensed by The Recording Academy. The term "Pre-GRAMMY®” is solely for the purpose of informing participants of the timing of the event. Alaffia, an organization based in Olympia, WA, empowers West African communities to become sustainable through the fair trade of indigenous resources and the sale of handcrafted body care products. Olowo-n’djo and Rose encourage empowerment through Alaffia’s community projects, women's cooperatives, education, and involvement in their local communities. Since 2006, Alaffia has funded 4,463 births, planted 57,575 trees, donated 7,482 bicycles to Togolese students, built ten schools, and provided school supplies to 32,842 students. “The only things that are certain is that my life will be forever sacrificed for the empowerment of all disadvantaged people, and that even if Alaffia was to disappear today from the face of the earth, the support and the opportunities that each and every one of you have given us over the years has profoundly impacted my communities for generations to come” said Olowo-n’djo Tchala, co-founder. Alaffia is a top donor to Whole Planet Foundation’s global microfinance programs in 69 countries including Togo and the United States, “Given the first average developing world loan size of $184, Alaffia’s donation of $200,000 to the Foundation has created more than 5,775 opportunities for impoverished entrepreneurs and their family members to live a better life. We are proud to honor Alaffia for their trailblazing impact in Olowo-n’djo’s native Togo and abroad, and to be joined by this year’s generous event sponsors like truRoots to raise funds for global poverty alleviation” said Joy Stoddard, executive development and outreach director of Whole Planet Foundation. The invitation-only benefit will be held at OHM Nightclub in Los Angeles, in the heart of Hollywood and the Walk of Fame. Founded in 2005, Whole Planet Foundation is a Whole Foods Market foundation that alleviates poverty worldwide where the company sources products. The nonprofit’s mission is to empower the world’s poorest people with microcredit and the chance to create or expand a home-based business and lift themselves and their families out of poverty. As of September 2016, Whole Planet Foundation is funding microlending programs through microfinance institution partners in 69 countries in Africa, Asia, and Latin America, including the United States, creating 9.5 million opportunities for entrepreneurs and their families to have a chance for a better life. To date, the nonprofit has authorized more than $71 million and disbursed $61 million through microlending partners worldwide. Learn more and donate online at wholeplanetfoundation.org.